Lockwood and Co is a rare animal: a thoroughly enjoyable middle grade story that has the depth and interest to appeal to all ages, especially adults. Characters are nuanced, the plot intriguing, mysteries build upon mysteries, and there is an overall story arc that will take several books to slowly uncover. I was never interested in supernatural/ghost stories but this really does rise above the genre. Story: For 50 years, ghosts have been a problem for England. Only the young can see/sense/fight them but the spectral visitors are returning in numbers – creating “The Problem” for modern England. Young Lucy is especially talented but an unfortunate incident has left her with no means of employment. She comes to Lockwood & Co hoping for a job fighting ghosts – but will get much more than she bargained for at the small agency. I really appreciated that there was layer upon layer of intricacies within the plot. The whole supernatural situation is well constructed and the worldbuilding supreme. Imagine a Dickensian type of London but in a modern setting and you have a good idea of the setting. 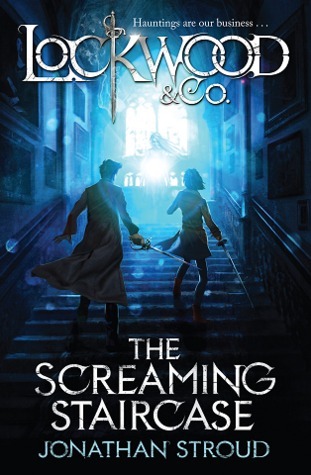 But in addition to the book-specific mystery that they solve (the Screaming Staircase), there are hints that each of the other characters have their own mysteries and skeletons in the closet. That means we have more than a ‘monster of the week’ plot and even more reason to anxiously await the next book. The hints are tantalizing and the books end with a very big reveal. I’ve read the first two books in the series and they are both excellent – the foundation of the first book sets up more intrigue in the second. Characters are built upon from book to book and even side characters (rival agencies, government officials, etc.) are given depth and grow. This was one of my favorite reads of the year. Note: I listened to the audible version and the narration was excellent. Reviewed from an ARC.